Are you ready to go tropical? That’s where we’re headed with this week’s post on Frangipani, which is another name for Plumeria. A beautiful tropical plant native to warm areas of the Pacific Islands, South American, the Caribbean and Mexico, Plumeria has long been treasured for its beautiful flowers, used by the Polynesians in traditional Leis. In skin care, we love frangipani because of its exotic, lush perfume, as well as it’s powerful skin properties. Frangipani oil comes from the Plumeria plant, which is native to warm, tropical areas. 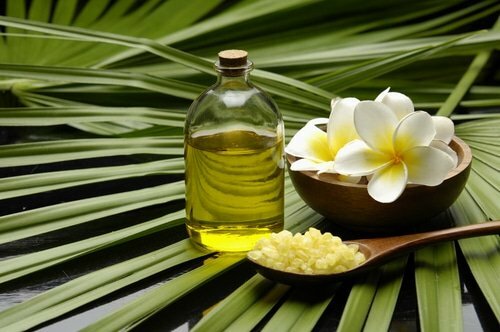 Frangipani oil comes from the Plumeria plant, a genus of flowering plants related to the Oleander. The plant is said to have been named after a 17th century French botanist named Charles Plumier, who traveled to the New World documenting new plant and animal species. The species includes about eight different variants, based primarily on the color of the blossoms and the shape of the leaves. Common flower colors include cream, yellow, red, and pink, though newer varieites may be orange, red, yellow, or mixed colors. The flowers are most fragrant at night, attracting sphinx moths to pollinate them, though they actually have no nectar. The plants reproduce when the moths transfer the pollen from flower to flower. The plant itself likes as much sun as possible, but it needs moist soil in just the right balance to offset the sun exposure. In optimal growth conditions, frangipani can grow to about 30-40 feet high, and will bloom throughout the year. The bark is grey/green and scaly, while the branches have a swollen appearance. Flowers appear in clusters and can be as big as five inches across. In past centuries, Plumeria was used as an ingredient in love potions because of its rich, alluring scent. In fact, it’s been called the “flower of sensuality” because of its perfume, and it’s a favorite of aromatherapists because of its ability to rejuvenate mind and body. In Polynesia, it’s said that if a woman wears Plumeria flower on her right ear, she is single and available, while wearing on the left signifies a committed relationship. Frangipani oil is also moisturizing, and is often used by massage therapists to smooth dry skin during a massage. A few drops in a warm bath can help moisturize and calm dry and dull skin. While those using frangipani oil will benefit from its moisturizing properties, most will notice its romantic scent before anything else. Try our Herbal Facial Oil for Oily Skin, which contains frangipani oil, and see what you think! Have you tried frangipani in your diffuser or in a candle? Please share your thoughts. Hi, Where can we buy it from?